The 800-word article is still the dominant form of online news from most publishers. 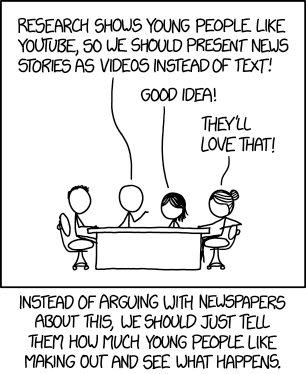 This largely seems to be a legacy from printed newspapers and to a lesser extent this is true for online news video online too, with much of it still produced in traditional made-for-TV formats albeit shorter. But back in 2014 research from Quartz found that “the place between 500 and 800 words is the place you don’t want to be”. They found that this length lacked both the focus and share-ability of a short piece and the pay-off of a longer piece. This length of article isn’t distinctive and is often duplicative. The news industry in 2017 has well-recognised problems around attracting and retaining audiences. There’s competition from all the other attention-sinks on the internet, the challenge of sustaining business models and the need to continually cope with increasing disaggregation of the news by tech platforms. One possible response to this situation is to develop new formats that are designed for news. Formats that better fit peoples’ habits and contexts and technology, or better meet the “user needs” (though what are the user needs for news? That’s quite a rabbit hole). Developing and popularising useful and attractive new formats could make news stories more recognisable when aggregated and consumed on other platforms, and provide more compelling reasons for people to visit the source sites and apps. For the inception of a BBC R&D project to explore alternatives to these conventional formats I’ve conducted a review of the landscape of digital news, looking for innovations in article and video formats online. 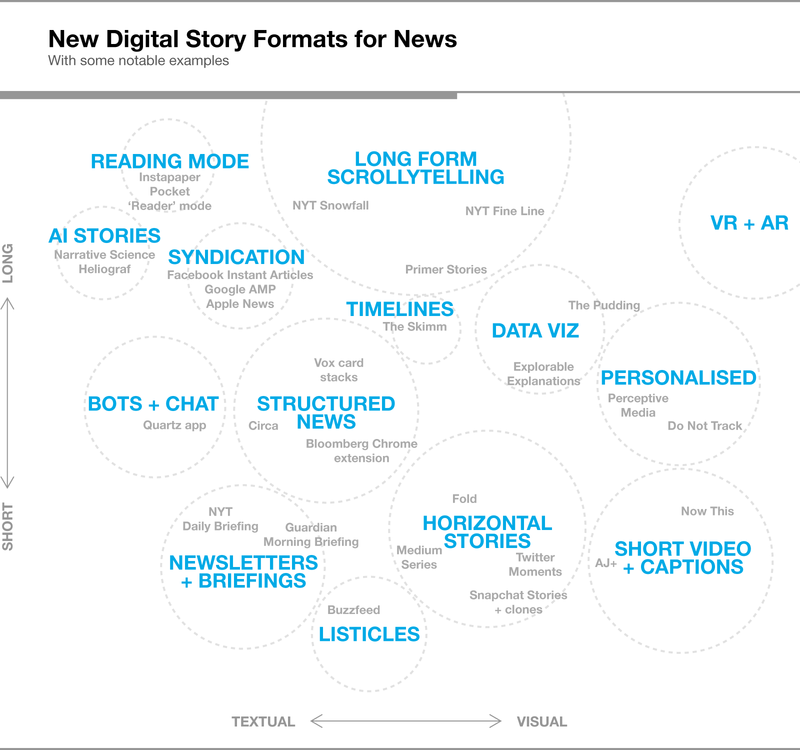 I’ve been looking particularly for story formats used for news that aren’t legacies from print or broadcast, that try to use the affordances of digital, that have been specifically designed for news and that are re-usable across stories and genres. This article (I know) describes what I found in each of these categories, plus a few examples that don’t fit and some developments that are shaping news formats. Online news videos have been getting shorter and taller as they become tailored to social platforms, phones and tablets. This style of video has also evolved beyond the traditional reporter-led TV news broadcast, driven by the proliferation of eyewitnesses shooting on phones and prominent YouTubers. Video is most effective when it’s a visual story that actually shows the thing that’s happening. This format was developed to fit into social feeds, and in situations where having sound isn’t appropriate or available. Pioneered by AJ+ and NowThis. Sometimes they don’t use source video at all but instead use stills to create a slideshow, perhaps with some Ken Burns effects. Coming off a design trend from a couple of years ago to use phone-sized screens of information, each screen contains images, large text or video that you navigate around by swiping sideways. 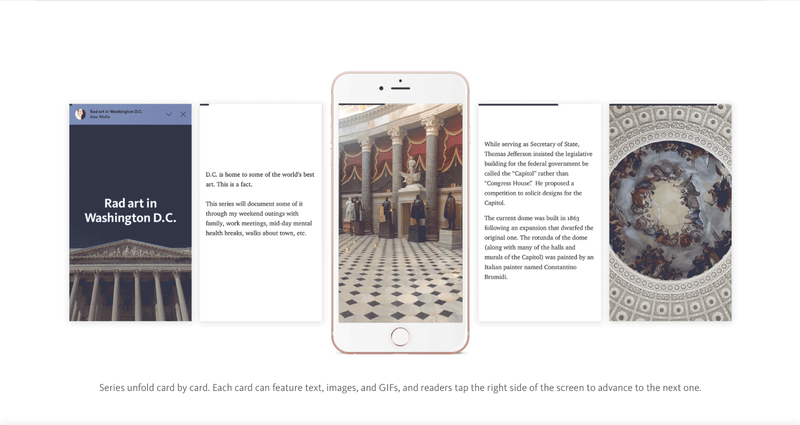 This has resulted in several card-based news formats, made mainstream by Snapchat Stories and its *Stories clones. See also FOLD, a platform for making card-based stories, Mashable Reels, Medium Series and a special shoutout to “Fish: A Tap Essay” which is the earliest encounter I can remember with this format. Starting with Snowfall, a whole slew of “scrollytelling” experiences appeared featuring scroll-driven animation, high quality images and lots of words. Here’s Body on the Moor from the BBC and Firestorm from the Guardian. There are several tools and toolkits now available that specialise in this format. This format is quite labour intensive to produce and requires a certain type of story to work well. 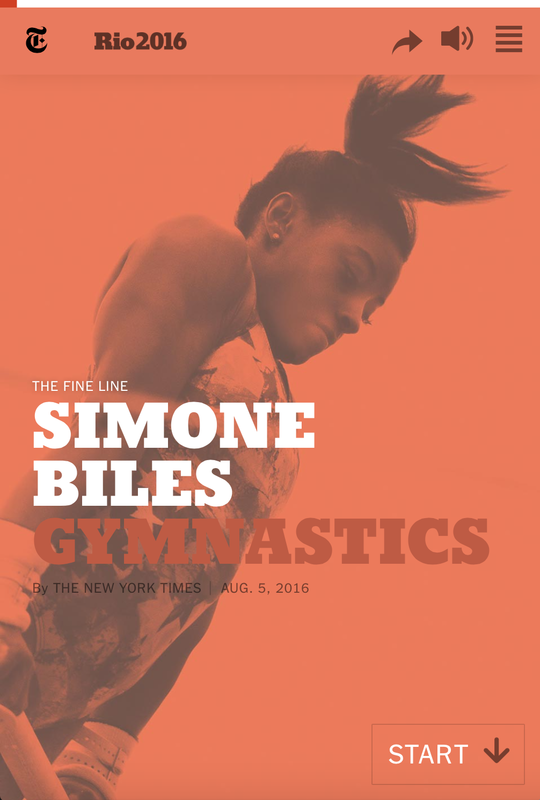 More recently the NYT Fine Line series was similarly visual and scroll-driven but with more reliance on video. There’s also a subclass of scrollytelling that animates maps as you scroll, like this one from the FT and this one about a trek through Japan. 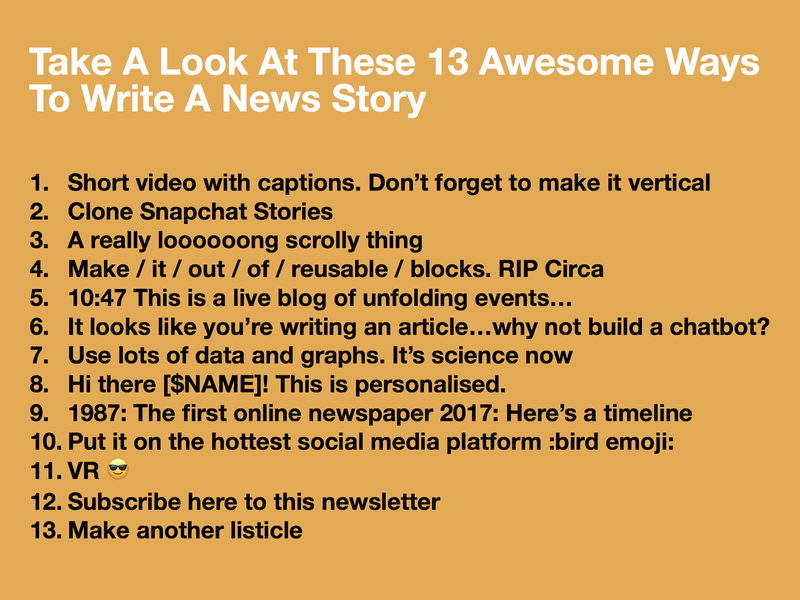 Circa was the original structured news app — built out of re-usable blocks or “atoms” that were used to present stories as updates, facts and quotes. It would track a reader’s progress and avoid showing them atoms they had already seen. Unfortunately it hasn’t survived, with only the brand living on. Similar concepts live on in re-usable fact boxes and explainers in Vox and the Guardian, and the BBC’s experiments with Atomised News. But they’re not made of properly structured data yet. See @StructStories and Jeff Jarvis’s essay on unbundling articles for more on this way of thinking. First pioneered by the tech press for conference coverage, then picked up for sports, and now commonly used for breaking news and covering other events deemed important enough. E.g. NPR live annotating a Trump speech. Meanwhile, live video streaming is emerging on platforms like Snapchat and Facebook. Or, re-emerging in this case, as live TV broadcasts have been around for years. Obviously the internet didn’t invent lists but it seems to have latched onto them as a successful format. Buzzfeed is famous for these — and they’ve got their headlines down to a fine art. Here’s a listicle about listicles. Short daily briefings seem to be a popular format right now. Although there is nothing particularly natively digital about them, they were developed for people trying to keep up with the overload of news and may have been influenced by the email newsletter trend. Examples include the Guardian’s morning briefing and the NYT daily briefing. I expected timelines to be more common in news, but I guess the focus on what’s happening right now in the news industry doesn’t always encourage the historical perspective. Sometimes timelines are interactive like this or sometimes they’re just lists of events. Timeline launched with an interesting presentation style, though it’s now a more conventional publication. 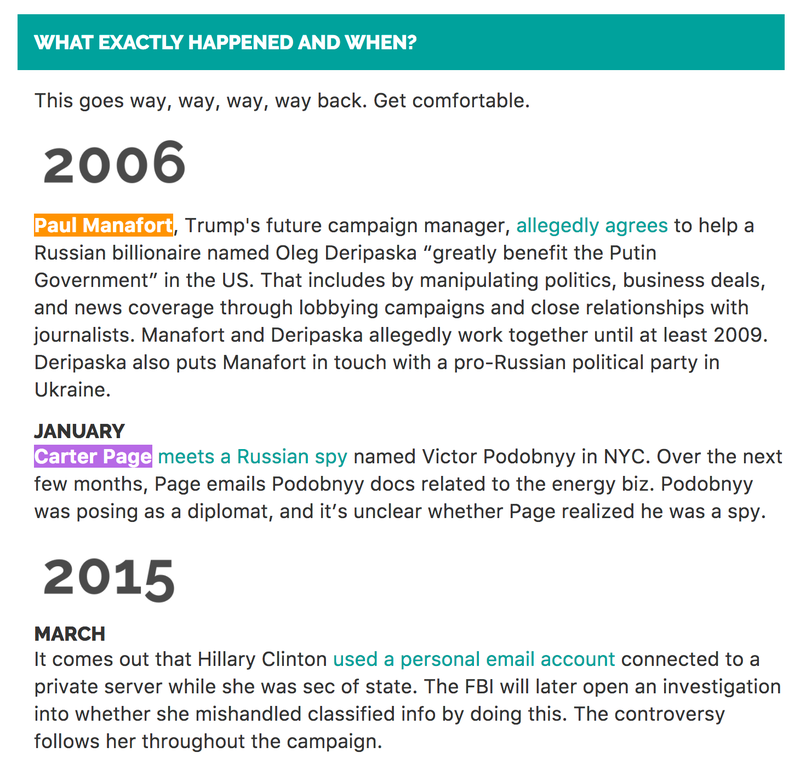 The Skimm’s timelines are text-heavy but are split into a summary timeline followed by a really comprehensive timeline. I particularly like the colour-coded highlighting of key individuals throughout. 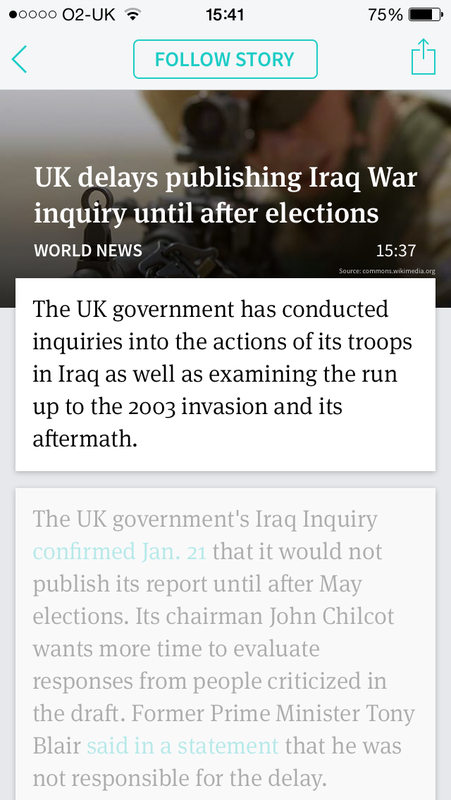 I love the Quartz chatbot app, which although not a chatbot (in the sense of a computer simulating conversations) is made of stories written by journalists in the style and tone of a messaging app. Other chat channels (or “bots”) from news organisation are mainly phone-trees that let you choose which story you want and then link out to it. The NYT Politics Bot used scripted conversations to tell the journalist’s story, though I’d argue there aren’t yet any bots that actually allow you to converse about the news. I’m also still waiting for a good choose-your-own-adventure telling of a news story. I like this multimedia article about bees from the NYT and this game about Syrian refugees looks promising, but I suspect that the closer you get to games the further you get from a re-usable, efficient format. Personalisation is almost always used to filter the choice of stories you have, but what if it adapted the story itself? The closest I’ve found is the perceptive media work from Ian Forrester, my colleague in BBC R&D, where parts of the experience are personalised based on things known about the user. You can also see this approach in the web documentary Do Not Track. By this I mean the data visualisation branch of data journalism, rather than the “finding stories in datasets” branch. They range from simply putting graphs in articles to highly interactive visualisations of data. 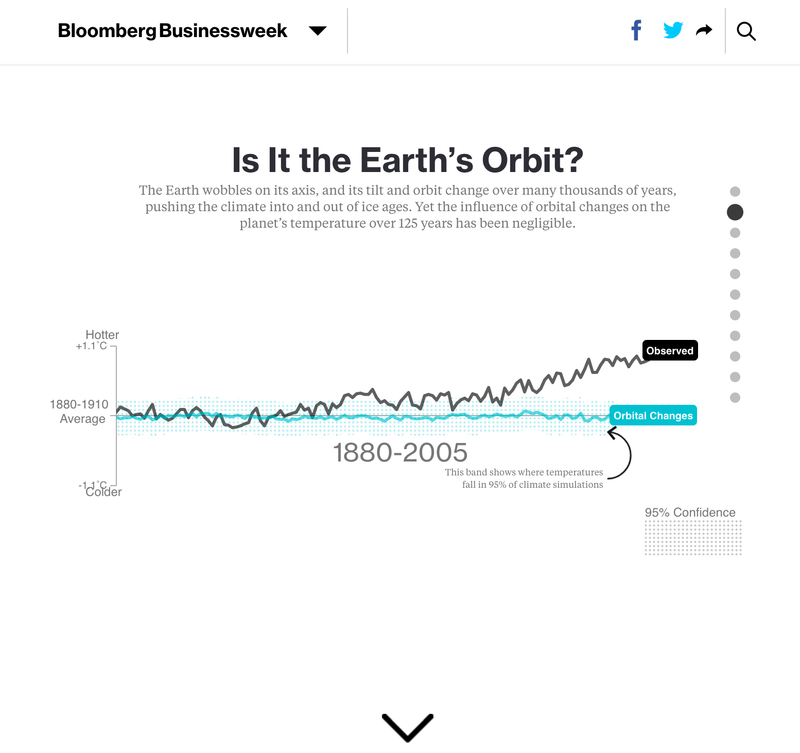 See this interactive article on climate change for example, or the visual essays at The Pudding. On a sidenote I particularly like the concept of Explorable Explanations from Bret Victor and Nicky Case that embed controllable, playable simulations into articles, but I haven’t seen these put to widespread use in news. Read this Reuters report from my BBC colleague Zillah Watson for everything you need to know about VR in news. Though futurist Amy Webb says VR for news is a red herring and AR will be the thing. Audio. I’ve missed audio-centric developments off this list because I haven’t yet found any significant innovations in audio news formats, beyond new methods of delivery. There are no reasons there shouldn’t be some digital-first audio formats — ie. podcasts that change length, but I may have missed something. I know there are some nascent experiments with voice UI and news coming soon. Twitter and its threads are a news format of sorts. Though Twitter Moments in the mobile app is very Snapchat Stories. Upsum is an experiment in news in a brief Q&A format. This is a really quite different video analysis article from the NYT. This is an annotated, fact-checked telephone conversation from the Washington Post. This Chrome Extension from Bloomberg and Postlight analyses news articles and presents related data and news. The format used at Primer Stories is a bit scrolly, but quite succinct and with illustrations rather than photos. Or maybe it’s a bit card-like but without the swiping. Originally RSS, this now includes Facebook Instant Articles, Google AMP and Apple News. Your news articles just flicker past in The Feed. Usually HTML only, probably fast, possibly short, hopefully it links back to original. What’s particularly important is that people increasingly get their news through these channels and will be familiar with their format and UX. Various “reading mode” platforms and apps (including read-later apps like Instapaper & Pocket or various browser’s read modes) strip out the increasingly complex and noisy navigation, ads and cruft from articles. They are increasingly used and are arguably a digital format in themselves, or maybe it’s just people choosing the old format of unadulterated text. These are often breathlessly described as AI-written stories (though I’m sceptical on how much AI/ML there actually is and how much is just templates-filled-with-numbers). Narrative Science seem to be the big player in turning structured data into text. The Washington Post has used its Heliograf tools to cover the Olympics and election results. Relatedly, Wibbitz will automatically create a video from any text content. To me it seems that there aren’t many new formats here that have been designed specifically to deliver online news on a scalable basis, and this confirms the thinking behind the project when it was first proposed. Frequently the news industry is taking formats developed elsewhere in the technology industry and repurposing them, or producing one-off, expensive innovations that aren’t repeated. Having said that, there are a few interesting things that the news industry has developed itself: Snowfall-like scrollytelling, data visualisation and the various attempts at structured news. The reasons for this perceived lack of innovation aren’t critical for me right now: maybe constant restructuring stops anyone doing sustainable things, maybe the challenges of monetisation dominate, maybe we can’t compete with the social streams or maybe Google and Facebook have won already. And this situation might be fine. Indeed, the 800-word article may well be the optimum format for delivering news, but there seems to be space for innovation and exploration and that’s what our project will attempt to do. So what could we explore? Articles with structure that create reusable atoms? Articles that adapt to a user’s devices, contexts or preferences, changing shape, tone or media? Articles that guide you through themselves? Videos that shorten or lengthen at a touch of a button? Right now, we’re starting off by looking at ways to combine text, images and video in a complementary and flexible manner, and at thinking about how to personalise news stories. If you know of any other interesting news story formats then please send them my way on Twitter. I have an ongoing collection of these format examples and more on this Tumblr. Take a look at Kevin Anderson’s report for Reuters, “Beyond the Article” that features seven case studies of new article formats. NPR have written about the limitations of the 800-word article and their experiments around this. Jeff Jarvis’s book on news futures includes a section on formats. “The rise of the horizontal story” from Paul Bradshaw reviews the horizontal story format. Round-up of developments in automated journalism from Tony Hirst. Many of the examples in this post were found via the excellent Nieman Journalism Lab. Thanks to chats with Kevin Anderson, Jacqui Maher, David Cohn, Nic Newman, Matt Locke & Paul Bradshaw plus my colleagues in BBC News and R&D. Thanks to BBC News Labs. R&D on the web for the BBC, executive producer @bbcrd. My thoughts, opinions and words here. We're an incubator charged with driving innovation in news.